Water and hydration is sooooo important! Especially for someone who is about to start regular exercising. Our bodies are made up of about 60% water. Water flushes out waste from our bodies and hydrates our skin. To avoid dehydration, the Institute of Medicine (IOM) recommends using thirst to determine your fluid needs. The IOM doesn’t specify requirements for water but it suggests 11+ cups of fluids a day for women is good. This number includes fluids that come from food (20%) and beverages (80% or about 9 cups). However, physical activity, heat, and humidity can increase our fluid needs. So keep your water bottles close at hand to avoid dehydration. When we go to the bathroom, it should appear pretty clear (pun intended). Drinking fluids helps us avoid constipation. Furthermore, a cup of low caffeine tea, milk and wine counts as fluids. Fruits and veggies hold tons of water, so drinking 100% freshly-squeezed juice also counts. Keep juices in moderation though – some are very high in sugars. Try to mix fruits that are high in sugar (orange, apples, mango, banana, grapes, etc.) with veggies and greens that are low in sugars (kale, spinach, celery, cucumber, etc.). Note that there is no fiber in juices – because the juicer filters only the liquid juice and not the fibrous skins. However, smoothies made with fresh fruits and veggies contain lots of fiber and more nutrients than juice because it includes the skins of the produce in most cases. Sodas are filled with sugars (artificial or not), empty calories, stimulants, additives and carcinogens that are not optimal for nutrition and hydration. Sodas contribute to tooth decay, broken bones (because the phosphorus strips the calcium from bone), belly fat, weight gain, diabetes, obesity, and addiction. If that’s not enough, the chemical lining in soda cans make your hormones out of whack. Scary. Make water as accessible as possible: keep a glass of water at your work desk or carry your water bottle with you. Stay away from soda, or any kind of sugary drinks that come in a bottle. 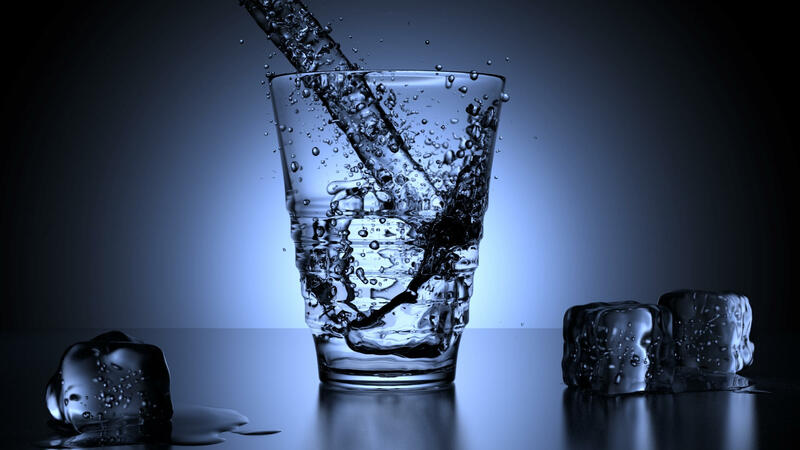 Drink a glass of water before and after every meal. Opt for sparkling water or tea with lemon, instead of soda. Find a smoothie shop nearby and chose a creative combo of your favorite fruits and veggies. Limit caffeinated drinks to 1-2 per day. Instead of syrups and creams, choose low fat milk and limit the amount of sugar you put in it to half a teaspoon or less. Try a lowfat iced latte instead of a sugary frapuccino.